Available now at local booksellers and Amazon.com. Available in paperback and as an E-book. Order a signed copy especially for you or a loved one from Peggy Rubin by emailing Peggy Rubin. 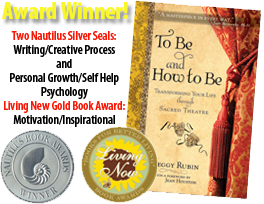 This book is the result of 20 years of workshops, training people to experience and re-create their lives as vibrant sacred plays. It is thus a training manual in passionate caring about your life, commitment to your life and joy in your life. It provides a fresh viewpoint, combining interest in the theatre with a dedication to the process of generating creativity and aliveness. In every chapter the theatrical element explores its relevance to one’s individual life and creativity, and the use of some of the world’s most powerful dramatic literature also provides guidance and informative insights into the Nine Powers. This book is designed for anyone willing to become a star in their own great play. And for people willing to reframe the way they see their lives. The effect of the book is an awakening of excitement, passion, commitment, and creativity. For the committed reader it will reveal itself as a learning manual for thinking in new ways, on many different levels simultaneously and consciously. “But past history and present-day hopes weren’t enough for Jean or for the conference. She and the participants wanted to know: How is theatre part of the sacred matter of the universe? How is it that theatre provides a metaphor for life on earth? Can it also provide a way to frame or re-frame human experience in useful, intelligible, enjoyable ways? Can theatre be seen, not only as a communal dancing ground (as I believe it began) but also as a space for re-imagining our lives? “So I began to wonder: Can the characteristics and containers of theatre as an art form be used in ways which also serve human creativity? Human awareness of the sacred? Human happiness? Even for humans not directly involved in theatre itself? Peggy Rubin is a master of theater and the art of becoming. Her book – a masterpiece in every way – will hold you spellbound as you discover the drama of your soul and the purpose of your life. The unique expression of your essence – the Divine theophany that you are – emerges almost magically as you read this clear, penetrating, and insightful book and work with the exceptional exercises. Brava, Peggy!" Joan Borysenko, Ph.D. 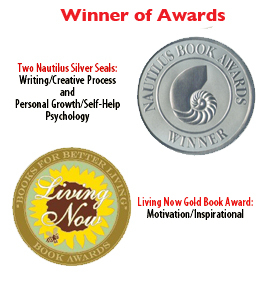 Author of Your Soul's Compass and A Woman's Journey to God. 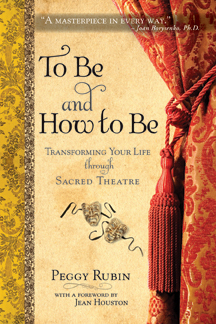 "From Sacred Theatre to sacralizing your life's story, Peggy Rubin takes you through an engaging and wonderful process that will expand your perspective in a myriad of ways and enrich your journey forever. We love this book." "I have always been able to employ in real life what I’ve learned in my theatrical training. Peggy Rubin has now made that process available to anybody who reads this book. It’s very readable and I highly recommend it." "Each of the arts offers models for the composing of lives, but, as Peggy Rubin demonstrates, theater perhaps most of all. This effervescent description of sacred theater should inspire us all as composers of our lives and caring actors in the world." Mary Catherine Bateson, author of Composing a Further Life: The Age of Active Wisdom. "Peggy Rubin’s brilliant elucidation of the nine powers of sacred theatre propels us away from any impoverished tunnel vision about our lives that we may have slipped into in the face of changing times. We find ourselves in a place where we recognize our lives for their full power and wonder, as a lifelong performance of sacred theatre. Peggy gives us tools from the best in theater tradition translated into effective life skills for sustaining and guiding us." Trish Broersma, author of Riding into Your Mythic Life, Transformational Adventures with the Horse. TO BE AND HOW TO BE presents an entirely fresh pathway to self-understanding. The book delights the ear, heart, mind, and soul, offering the riches of a deep love for the theatre and the harvest of a long and wide-ranging study of literature, spiritual traditions, and brain and energy research."